Dheepan is a 2015 French crime drama film directed by Jacques Audiard and co-written by Audiard, Thomas Bidegain, and Noé Debré. The film was partly inspired by Montesquieu's Persian Letters. The film tells the story of three Tamil refugees who flee the civil war-ravaged Sri Lanka and come to France, in the hope of reconstructing their lives. The film's title character, played by Antonythasan Jesuthasan, was a former Tamil Tiger child soldier. The film won the Palme d'Or at the 2015 Cannes Film Festival. It was shown in the Special Presentations section of the 2015 Toronto International Film Festival. Audiard started making the movie with the intent to make a variation of Sam Peckinpah's 1971 thriller Straw Dogs. But he wanted to set it in a community that no one in France knew much about. He and his writing partner, Thomas Bidegain, decided on the Tamils. During filming, Mr. Jesuthasan sometimes made corrections for accuracy. Dheepan opened in France on 28 August 2015. The film grossed $3,882,022 in France and $999,774 elsewhere for a worldwide total of $4,881,796. The film received largely positive reviews from critics. On Rotten Tomatoes, the film has a 90% rating based on 62 reviews, with an average rating of 7.9/10. The site's consensus reads, "Dheepan offers a timely, powerful look at the modern immigrant experience in Europe.". Metacritic reports a 77 out of 100 rating, based on 19 critics, indicating "generally favorable reviews". Director and stars at the 2015 Cannes Film Festival. The film won the Palme d'Or at the 2015 Cannes Film Festival. After winning the award, Audiard said "To receive a prize from the Coen brothers is something pretty exceptional. I'm very touched". When the film award was announced, the international press corps responded a mixture of boos, shrugs and applause. After the announcement ceremony jury co-presidents Joel and Ethan Coen noted that ''everyone [on the jury] had some high level of excitement and enthusiasm for it." Ethan Coen called the jury's decision "swift." According to critic Andrew Pulver, the film "may not be the director’s most immediately electrifying film, but in its understated way, it’s an immensely powerful work". Commenting on the film, critic Jason Gorber notes that besides depicting immigrant experiences and integration, the film "is polemical without being didactic, and its message about human spirit and how connections of love can flourish in the most astonishing of ways is extremely moving". The Independent called it "a radical and astonishing film that turns conventional thinking about immigrants on its head". ↑ "Dheepan (15)". British Board of Film Classification. 21 December 2015. Retrieved 7 January 2016. 1 2 "Cannes Film Review: 'Dheepan'". Variety. 21 May 2015. 1 2 "Dheepan (2016) - International Box Office Results". Box Office Mojo. Internet Movie Database. Retrieved 7 January 2016. ↑ "Cannes 2015 : 3 choses à savoir sur "Dheepan", le nouveau film de Jacques Audiard". Metro International. Retrieved 24 April 2015. ↑ "'Dheepan': Cannes Review". The Hollywood Reporter. Retrieved 24 May 2015. ↑ "Cannes winner stars Sri Lankan former child soldier". inquirer.net. Agence France-Presse. Retrieved 2016-06-05. 1 2 "Toronto to open with 'Demolition'; world premieres for 'Trumbo', 'The Program'". ScreenDaily. 28 July 2015. Retrieved 28 July 2015. 1 2 Donadio, Rachel (2016-04-20). "For Its Star, 'Dheepan' Was the Role of His Lifetime". The New York Times. ISSN 0362-4331. Retrieved 2016-06-05. ↑ "Dheepan (2015)". Rotten Tomatoes. Flixster. Retrieved 7 January 2016. ↑ "Dheepan reviews". Metacritic. CBS Interactive. Retrieved 7 January 2016. ↑ "2015 Official Selection". Cannes Film Festival. Retrieved 16 April 2015. ↑ "Screenings Guide". Cannes Film Festival. 6 May 2015. Retrieved 8 May 2015. ↑ Rebecca Ford (24 May 2015). "Cannes: 'Dheepan' Wins the Palme d'Or". The Hollywood Reporter. Retrieved 24 May 2015. ↑ "Cannes Palme d'Or awarded to French film Dheepan". BBC News. Retrieved 25 May 2015. 1 2 Chang, Justin (2015-05-24). "Cannes: Jacques Audiard's 'Dheepan' Wins Palme d'Or". Variety. Retrieved 2016-06-05. 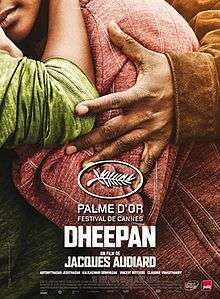 1 2 "French film 'Dheepan' wins Palme d'Or in upset Cannes finale". NY Daily News. Retrieved 2016-06-05. ↑ Pulver, Andrew (21 May 2015). "Dheepan Review". The Guardian. ↑ "Cannes 2015 Review: DHEEPAN, Powerful With Moments Of Sheer Bravado". Twitch Film. Retrieved 25 May 2015. ↑ "'Golden Years,' 'Marguerite,' 'Dheepan,' 'Mustang' Lead Cesar Nominations". Variety. ↑ "Les " Magritte du Cinéma ", c'est le 6 février prochain à 20h00". Cinergie. ↑ "'Dheepan' and 'Paulina' triumph in Miami". Screendaily. 13 March 2016. ↑ "'Mad Max: Fury Road' Wins Best Picture of 2015 From Online Film Critics Society". Variety. 13 December 2015.